Here’s a little known truth about classroom libraries—teachers who have well-stocked libraries often have fewer discipline problems. Whhhat? Yessiree, it’s true! Kids get into mischief when they have time on their hands, but not so much when they’re captivated by interesting reading material. So how might a teacher get a gold mine of reading material without spending too much hard-earned cash? Keep reading! 1. Yard sales: Grab a cup of joe and cruise weekend yard sales. Shop early for the best selections. Shop late for the best deals. 2. Thrift stores: Plenty of gems are to be had here. Discounts may be given to teachers. 3. Social media: Tell friends and family you’re gathering reading material for your classroom library. Request donations of used children’s books and brochures from summer excursions. 4. 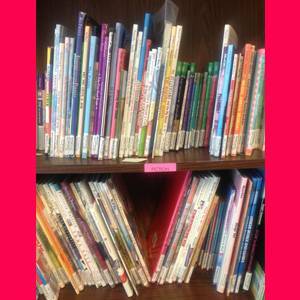 Local library sales: Public libraries receive book donations on a regular basis. Many of these titles are saved for book sales. Books are priced inexpensively, and the money goes back to support public library programs. You can find out about books sales in your area at Book Sale Finder. 5. Swap! Two or three times a year, trade a box of classroom reading material with a teaching colleague for fresh reading material that doesn’t cost a penny! Now, what tips do you have? Congratulations to Diana, Darlene, Connie, Tammy, and Heather; the winners of our First Friday Giveaway for July! I love the teacher to teacher sale sites on facebook. Teachers love books and love to pass them along cheaply plus you can get lots of other things on them. I too frequent the library sales and a couple of times by reading the library newsletter I found that after the book sales they will give to teachers left over books. I have found several treasures for free that way. I also use my bonus points from Scholastic and I go to Scholastic warehouse sales. The prices at the warehouse sales are amazing. Plus, you can volunteer to work at the warehouse sale in exchange for free merchandise. I have written grants for books for our classroom library and for guided reading library! Many parents donate books or gifts for special holidays! I like to help when neighbors are moving. Often when they find out I teach, they volunteer boxes of books and supplies. I don’t help for this reason, but it is a nice perk.